Interested in learning more about the public relations field? Wondering if public relations is the right major for you? Get all your questions answered at the official student orientation, #KnowPR Night event, on Wednesday February 24th from 5:30-7:30pm in Allen Hall 141. 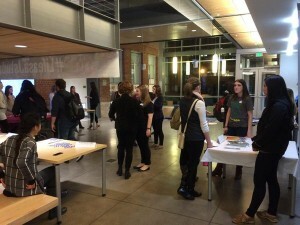 Ask questions, talk to student organizations in the School of Journalism and Communication (SOJC) and mingle with current public relations students and staff. 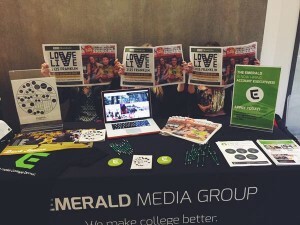 The Emerald Media Group’s table at last year’s #KnowPR Night. As a night hosted by J-School organizations themselves, PRSSA and AHPR, will provide students with the opportunity to visit the tables of various student groups before and after an orientation presented by Department Chair, Kelli Matthews (Follow her on Twitter: @kmatthews). Matthews will be introducing the department’s PR faculty, presenting the class sequence, along with an explanation of each required class, and answering questions about the public relations major, acquired through the University of Oregon. Following the event, AHPR and PRSSA will provide pizza along with a raffle, where prospective PR students will have the opportunity to win prizes from J-school student organizations. #KnowPR Night is a great way for students to explore the public relations sequence at the UO and learn more about the opportunities the SOJC has to offer. The event is the perfect opportunity to get involved with student groups seeking new members who have a willingness to learn and are full of energy. 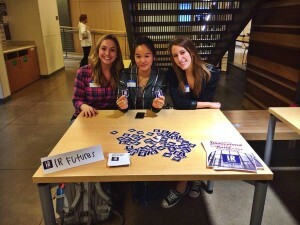 IR Futures, one of many student organizations that participated in the 2015 PR orientation. So join the conversation. For the next two weeks leading up to the event, the SOJC will be partaking in a Twitter discussion about the public relations major at the university. Follow the hashtag, #KnowPR, and the @SOJC handle to learn more about the PR sequence and its perks.